There is a long tradition in the Western world of likening the effects of alcohol to the ecstatic frenzy of divine possession. Socrates likened poets to bacchants, the followers of Bacchus or Dionysus, god of wine and inspired madness, that is, giddy intoxication and frenzied hysteria. Country music came to employ the pedal steel guitar as the musical equivalent of drunken self-pity and indulgence, and many a country song has been written on the self-pitying drunk’s best friend, Jack Daniels. By getting drunk, one seeks the pleasure principle. But when booze doesn’t work, as in Merle Haggard’s “Tonight the Bottle Let Me Down,” it forces the singer to confront the harsh reality principle, allowing old memories (of love) to “come around.” Hence drunkenness in popular music is frequently sought as a way to achieve drug-induced amnesia, a way to escape the terrible realities of existence, most often heartbreak. As Samuel Johnson observed, “He who makes a beast of himself, gets rid of the pain of being a man.” Hard whiskey, however, is a double-edged sword, because its effects are unpredictable: it may allow the drinker to escape acute self-consciousness, or do just the opposite, bring about a state of hyper self-awareness, and only exacerbate one’s crippling misery. Wine is often perceived to be a safer path to drunken self-indulgence than hard whiskey: wine is perceived to be a more benign, slower, and pleasurable--mellower--path to inebriation than the drastic measure of being knocked to your knees with just a few shots. Originally written and recorded by Neil Diamond in 1968, “Red Red Wine” was soon covered by Tony Tribe, a Jamaican rocksteady singer, who recorded a reggae-influenced version. 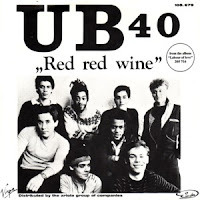 Tony Tribe’s version in turn influenced UB40’s later, 1983 cover of the song—I suspect UB40 band members may never even have heard Neil Diamond’s version when they recorded their hit version.